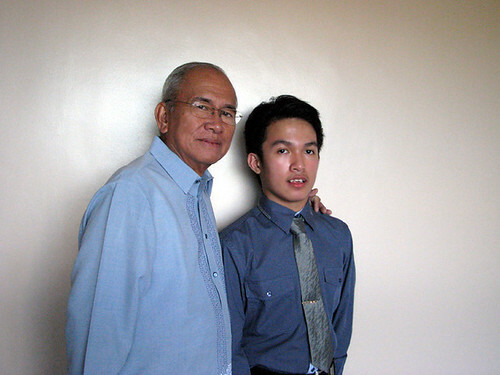 Tukayo -- Lolo Carlo is young Carl's idol and confidante. On the first week-end of September 2012, I had the good fortune to be invited to attend the Regional Conference of ASP held at Carmona, Cavite. The eye-opening conference has given me a new outlook on autism and other forms of learning disabilities. I was amazed at the "hearty" spirit of everyone at the conference. And armed with my new learnings, I have been pondering on our family's own experiences. The 8th of December 1992 was the date that God answered my prayer for a grandson, my first. The baby was fair skinned with chiseled nose, thin lips, and meaningful eyes enough to pass as handsome. For many years, there were no signs that the child was anything but the perfect grandson I believed him to be. When my daughter confided to me that my grandson was diagnosed to have autism, my mind was hit by an avalanche of questions. I started to research on my family tree and found nothing to relate to the disability of my grandson. My constant fear then was that autism is synonymous to being unintelligent. I started to be more observant. One of my grandson’s early fascinations was a complicated jigsaw puzzle, which he assembled effortllessy. One time, I intentionally disassembled his work and that was my first experience of one of his tantrums my daughter had only told me about. Difficulties aside, I saw hope. More important still, my daughter and my son-in-law saw hope. They were resilient. They did not give up on their son and to their credit, the approach they chose developed him in ways which exceeded my expectations. In his growing years, Carl would amaze me with his stock of knowledge. If his fascination is on Popes, he could recite the names of the Popes, the year they were installed, those who were assassinated, and those who died of disease. If his focus is on Presidents of the United States, he can even name their Vice Presidents from the time of Abraham Lincoln. When his focus was on world’s tallest structures, he could enumerate the top ten tallest buildings, who were the builder, the problems they encounter, the year they complete a certain floor. Slowly my grandson was brought to the mainstream of society. He started manifesting "typical" tendencies like having crushes on his classmates and attractive teachers. He cherishes helping his father in their business. He does data encoding and even goes to the bank to deposit their collections.